This project explores cross-cultural and transnational analysis of relationships among sovereignty and casino gaming in Asian and North American gaming enclaves. It specifically attends to comparative study of Macau’s unique “sort-of sovereignty” (Clayton, 2010), which stems from the city-state’s historical status as a jointly- administered Sino-Luso locale; and the “inherent sovereignty” of North American tribal nations, which has enabled the development of Native American casino gaming in the United States. Tim Simpson is Associate Dean of the Faculty of Social Sciences, and Associate Professor in the Department of Communication, University of Macau, where he has worked since 2001. He is the co-author (with UK-based photographer Roger Palmer) of the volume Macao Macau (Black Dog Publishing, 2015), and editor of the book Tourist Utopias: Offshore Islands, Enclave Spaces and Mobile Imaginaries (Amsterdam University Press, 2017). 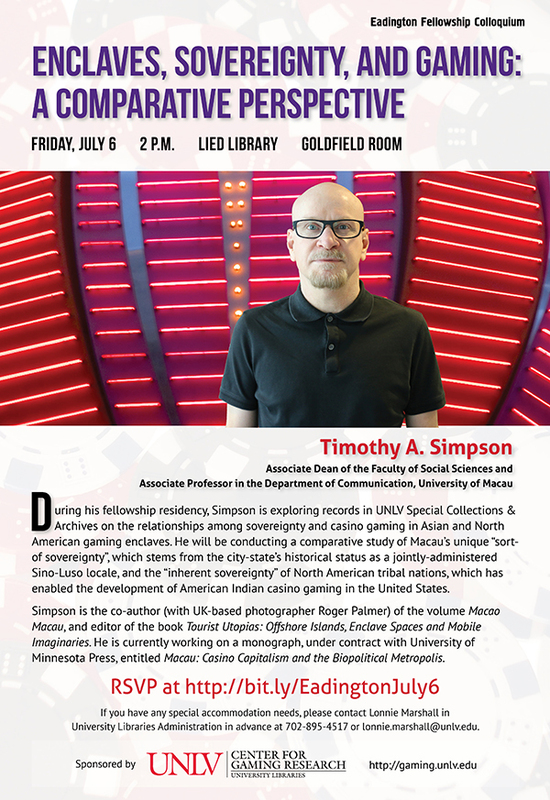 He is currently working on a monograph, under contract with University of Minnesota Press, entitled Macau: Casino Capitalism and the Biopolitical Metropolis.